Holy cow am I in love with this kid. 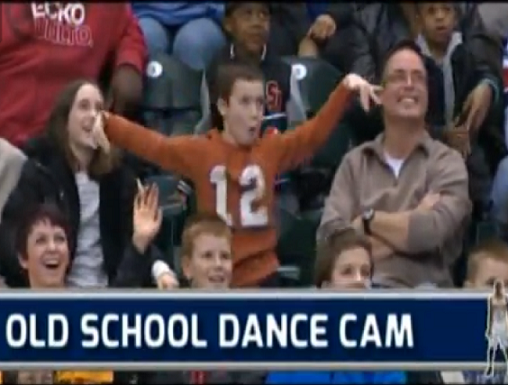 He was captured on the "old school dance cam" at a recent NBA game between the Pacers and the Rockets, and his moves are killer. The second "It's Tricky" by Run-D.M.C. comes on, he's up and out of his seat jamming along. Shy he is not, and he appears to have not a single inhibition. Plus he's good. Check him out. How awesome is he? Some kids might freeze upon seeing a camera on them, but not this little dude. He totally took that moment and seized it. I'd love to know where he learned those moves, and I'm in awe of his total confidence. I hope he never loses that. His dad seems delighted, but his mom seems a little embarrassed as she puts her head in her hands at one point. But she should be proud -- her boy has the moves ... if not like Jagger, at least like someone who's totally going to rock his school dances for years to come. Do you love this kid's moves? Can your kids dance?